Friends of the Ballard Locks: Help Us Confirm: Who's In First? Help Us Confirm: Who's In First? Researched and Written by Tom O'Grady. On July 4, 1917, the Government Locks of Seattle were opened to great celebration and fanfare. Although the locks had actually been open and locked thousands of vessels through by this time, this national holiday was chosen to officially mark the completion of a project contemplated for decades and under construction for some five years. 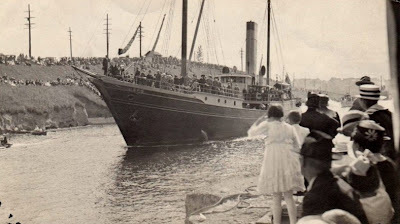 The President had sent the Roosevelt, a steamship used by Admiral Peary on his arctic expeditions, to be the head of a nautical parade and thus the first vessel to "officially" use the locks. To send such a noteworthy vessel to attend these ceremonies is clear indication of the importance of the opening of the locks. "I heartily congratulate Seattle and Washington on the completion of the canal. It is of great consequence commercially and may become of at least as great consequence from the navy standpoint. The event you celebrate is of consequence to the whole country. Hundreds of boats, canoes and rowboats of all sizes were to join the parade and were waiting in Salmon Bay to join the flotilla as it emerged from the locks and accompany it to the final inland destination inside Lake Washington. Thousands of onlookers had gathered to watch this spectacle all along the canal and there were several spots where the boats stopped to deliver speeches by dignitaries. Exhibitions and entertainment were staged along the route as well. This is how the events of the day have widely been reported. Elmer was a local outdoor enthusiast with a particular passion for canoeing. There are many photos of that day showing dozens of canoes and rowboats among other small craft, all of which had come out to share in the celebration. Elmer was in one of these. We were recently contacted by his daughter, Pat, who informed us that Elmer had always maintained that in fact, when the gates of the lock were opened to allow entry into the canal to Lake Union, it was actually he who paddled through first! The history of naval exploration has produced numerous competitions as many nations and individuals sought to be the first to be able to claim they discovered or successfully navigated a particular waterway. Seattle has joined the list of contested naval claims with this new information and it's time to resolve the conflict over who was in first. Was it Captain E. Blerd who piloted the Roosevelt or the Northwest's own Elmer N. Reed paddling his own canoe? Do you have any light to shed on this? Any old photos or other information from the day? While the picture below clearly shows the Roosevelt from water level and demonstrates that Elmer was in the water on the day, we're looking to find a photo showing the boats leaving the locks. So, all you historians out there, this is your chance to rewrite history and give Elmer his due. 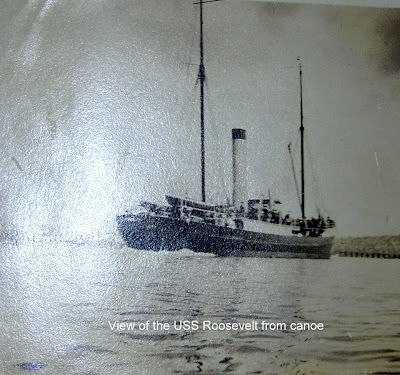 Photo of the Roosevelt sailing through canal is courtesy of USACE. Photos of Elmer Reed and his view of the Roosevelt are taken from Pat Reed's family photo album. The Ballard Locks by Adam Woog.